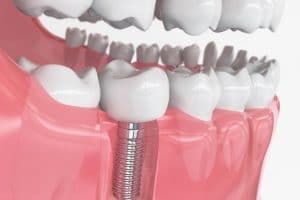 Tooth loss can be devastating to more than just your smile, but these days, many patients can successfully address tooth loss concerns with the help of one or more dental implants. For example, with an appropriate number of implant posts, patients throughout Encinitas/San Diego can rebuild their smiles with tooth replacements that closely mimic their healthy, natural teeth. That includes the roots that you lost along with your teeth, which are essential to the preservation of your jawbone structure and the long-term state of your oral health. A dental implant-supported restoration consists of three parts: the implant post (or posts), abutment (or abutments), and your custom-designed restoration (crown, bridge, or denture). The implant post and abutment are the main difference; after the post is inserted into your jawbone and the bone structure has healed around it, an abutment can be attached and utilized to secure your replacement tooth or teeth to the implant posts. Every implant post is created and implanted individually. This means that they can be utilized to address tooth loss of all degrees, from a single missing tooth to severe or complete tooth loss. After a thorough examination, your oral health expert can determine how many implant posts would be most appropriate for supporting your custom prosthesis. Fortunately, each post can withstand a maximum amount of bite pressure so you won’t need to receive a post for every tooth you’ve lost. In addition to improving the levels of comfort and support that your replacement teeth enjoy, dental implants also have a significantly positive impact on your long-term oral health. For instance, after a tooth root is lost, your jawbone receives fewer nutrients due to the diminished stimulation. Dental implants are the only option for reestablishing that simulation, and therefore, restoring the healthy flow of nutrients to your jaw. If you’ve lost one or more teeth, then you should consider replacing them with an appropriate number of lifelike dental implant posts. For more information, schedule a consultation with Dr. Kania by calling her periodontal office in Encinitas/San Diego, CA, at (760) 642-0711.